Richmond is where you can eat, play, explore, and shop unlike anywhere else in the world. Stunning nature, delightful culinary adventures, and a unique multicultural essence will delight your senses and ignite your curiosity. Here’s a taste of what Richmond has to offer. Travel the Dumpling Trail and visit the Golden Village for the most authentic Chinese food outside of China, or try the 800+ other restaurants serving food from around the world. Don’t miss the Richmond Night Market for a unique street food experience, and meet the city’s emerging food and drink producers in East Richmond. Richmond’s weather and geography make it ideal for waterfront bike rides as well as whale watching expeditions where you’ll see orcas, porpoises, sea lions, eagles, and more. Or check out the Olympic Experience at the Richmond Olympic Oval, Canada’s only official Olympic museum, and experience winter Olympic sports on hyper-realistic simulators. 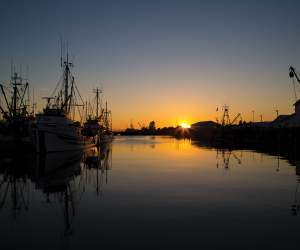 Richmond is home to two stunning National Historic Sites, both located in the historic fishing village of Steveston. Britannia Shipyards is where wooden ships were once handmade, and few places tell Richmond’s early story like the iconic Gulf of Georgia Cannery, once the epicenter of Canada’s Pacific fishing industry. Beautiful Garry Point Park, located not far from both sites, makes a great place to rest and enjoy the waterfront before a relaxing stroll. Malls, big box stores, and boutiques offer a variety of shopping experiences. Bring home a piece of Richmond with Steveston Village’s artisan crafts, eclectic fashions, and locally handmade gifts. And for those seeking high fashion without the high prices, McArthurGlen Designer Outlet offers up to 70% off on luxury brands. Explore national historic sites, art galleries, museums, temples and more. Eat your way through Richmond's famous night market. This is a shopper’s paradise, filled with bustling malls, big box stores, and charming boutiques.